Pastor Jerry Madden, who leads Praise Cathedral in Greer, SC has a Barnyard Ministry, more correctly, a Barnyard Flea Market ministry. No small church, a thousand or more worshippers crowd into the impressive gathering every Sunday. Great singing. Terrific preaching. Good people. Wonderful fellowship. 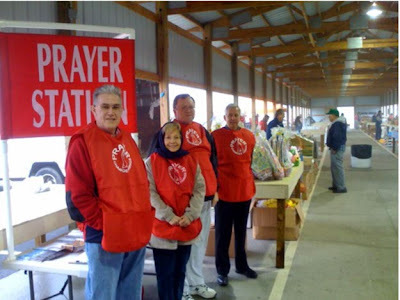 He sent me a report of a recent Saturday in which a prayer team set up shop at the local flea market – what a story. What a great idea! I am suffering from depression. I need the Lord. Female – age 40. Lots of health problems. A young man, aged 35, asked prayer to find a job. Two women were opening a business, and wanted prayer for its success. A young man, 31, has brain cancer. The doctors have given him little hope. He is both angry and depressed. He has a 2 year old daughter. His mother also requested prayer for wisdom in dealing with this. A man who had injured his foot at work, wanted a prayer for healing. A woman whose husband died, only a few weeks ago in a car accident, needed prayer. He was her only source of income. Her money is gone. She has a dependent teenager. They are looking for a church. An empathetic uncle requested prayer for a nephew whose father had died that morning. The man, from Mexico, can’t return for his father’s funeral. Called to preach only weeks ago, a 63 year old man requested prayer for wisdom and boldness to preach the Word. Steve wanted healing in his body. Vickie has cancer, her sister-in-law requested prayer for her. Robin’s husband lost his job. Pray that she will be able to stop smoking and for their financial needs. Joe just wants the Lord to help him more clearly understand the Bible. Holly is going through a divorce. She has been married only four years and has two children. Brian wants his father to be saved. Ruth had open heart surgery just last Thursday. How extraordinary that people would share such personal needs. When friends seem closed to witness, they are often open to prayer. When words will not convince them, prayer will open them up to the loving presence of a pursuing God who will reveal himself to them.